I'm not a huge fan of using highlighter on my checks since the shimmer has a way of accentuating pores. So I wanted to get a highlighter that would brighten up my complexion without it being overly glittery. 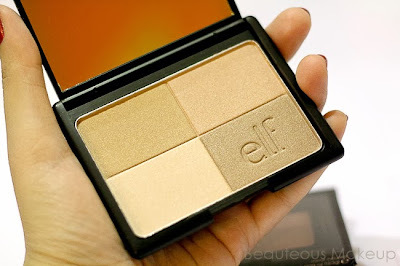 Thus I came across the Elf Studio Golden Bronzer. Create a healthy looking glow all year round! The sheer soft powders provide the perfect hue of colour. Blend all 4 colours together to achieve a blend of perfection or choose your favorite colour or colours to mix, match and blend. 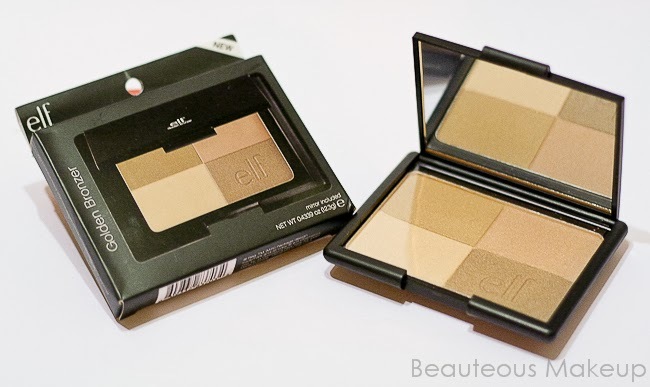 The ELF Studio Bronzer come in 3 shades total. Out of the 3 I picked out Golden since I was looking for a warm shimmery highlight. Let's talk about the packaging. 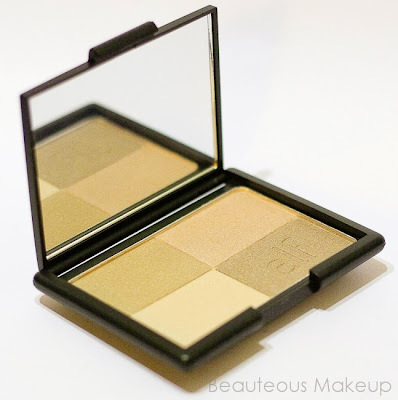 The powder comes in a really huge compact, its split up into 4 shade variations from light beige to a darker bronze. You can dip your brush into each shade since its large enough to work as individual shades. I love the huge mirror it comes with, it's perfect for travelling. 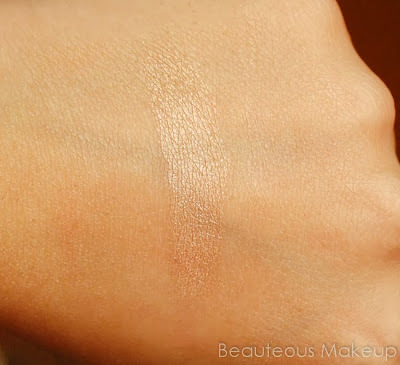 This is definitely not a bronzer for medium to dark complexions, its very pale to work with. For me I wanted to get this as a natural highlight. It has a gorgeous luminescent sheen to the skin. Its not over powering which I really like about this powder and its exactly what I was looking for. Its not chalky as some highlighters tend to be. The powder has a stiff creamy texture. I didn't experience any huge powder fallout or fluff from the pan but you do have to press your brush into the powder to get the product out. Application wise it applies beautifully onto the skin. Since it has a stiff texture the powder didn't spread all over my cheeks and face. Wherever you place it it will stay put. You can choose to use a fluffy brush to add a glow all over your skin or use a smaller/stiff brush for target highlighting on the cheekbones. I tend to avoid using this anywhere near my nose since it will accentuate any pores. I prefer to apply it on the uppermost part of my cheekbones. The darkest shade can be used as a bronzer to add some warmth to your cheeks. If your in a pinch- this also works lovely as an eyeshadow! It lasts all day with some minor fading. WOW! This looks really great, I'd give it a shot. Its staying power is as good?? dear, does beauty joint delivers your parcel safely even if non-traceable shipping is chose? and which courier delivers it? Aww crap. I just placed two HUGE elf orders, not knowing this was exactly the product I'm looking for. I just saw it on their website and thought 'naah' and didn't look it up because I thought it was just a regular bronzer for contouring, and since I don't contour I wasn't interested. Well who knew this was a gorgeous deep highlight. Hope I'll spot it Target.